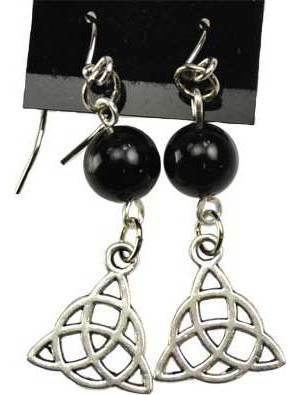 An elegant pair of Triquetra earrings adorned with Black Onyx prayer beads positioned atop the Triquetra points. May increase energy and aid meditative thoughts, as well as remind and refocus energy during mundane actions throughout each day. Crafted from 1/2 inch Pewter charms and Surgical Steel French hooks with 1/4 inch tumbled and polished spheres of natural Black Onyx, approximately 2 and 1/8 inches in length. Made in the USA.